Lisa Marie Presley will perform with her five piece band for eight Australian shows only when she tours in March as part of her STORM & GRACE WORLD TOUR. It's her first Australian tour in eight years. With all the hoopla that has surrounded her, it's easy to forget that Lisa Marie Presley is at heart a simple Southern girl whose earliest musical memories are of obsessively listening to 45's in her bedroom at Graceland and of her dad catching her singing into a hairbrush in front of a mirror at the age of three. 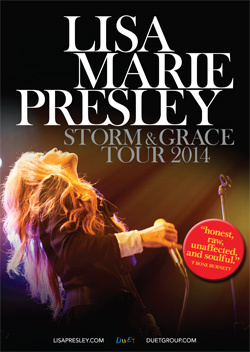 The Memphis-born Presley reclaims those roots on her latest album Storm and Grace released in Australia in 2012. — an Americana-inspired showcase for her songwriting talent and smoldering alto voice. Produced with elegant restraint by 12-time Grammy Award-winner T Bone Burnett, Storm and Grace is a marked departure from Presley's previous albums, 2003's gold-certified To Whom It May Concern and 2005's Now What, which both debuted in the Top 10 on Billboard's Top 200 chart, "I love the songs, but I think I was hiding behind a lot of sonic layers because it was scary to go out there," Presley says. "It's easier to bury yourself in the noise so you don't stand out. This album is a lot more stripped-down and naked, both musically and lyrically." "Storm & Grace is the album she was born to make – a raw, powerful country, folk and blues collection that finds her embracing her Southern roots and family name," said Rolling Stone. Entertainment Weekly praised the "smoky, spooky" single "You Ain't Seen Nothing Yet" while Spinner.com observed: "Presley has made the strongest album of her career ... It's a moody masterpiece, exploring the demons and angels of her life to the tune of country-spiced downbeat pop." Memphis' Commercial Appeal called Storm and Grace "a homecoming: a sumptuous album of country-soul, blues, and roots oriented songs that confirm her Southern lineage." Meet & Greet: $225-The meet and greet will take place after the show. It is imperative that you supply all your contact details in the checkout process so that we can contact you in relation to this. Includes show ticket.